Warriors of Faith: The Three Archangels. 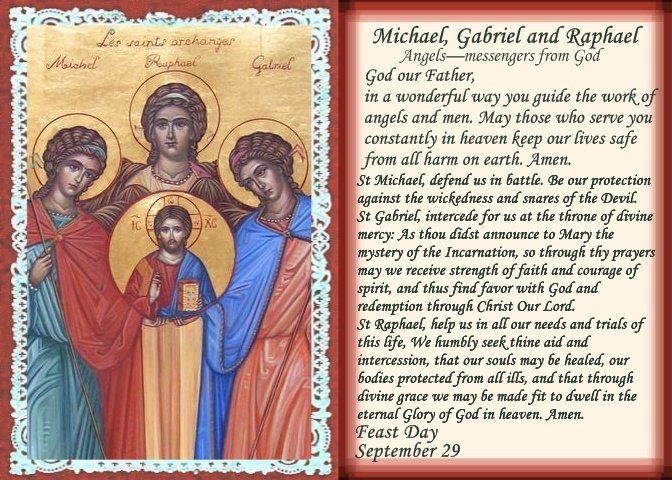 The names of the Three Archangels are Michael, Gabriel, and Raphael. Angel of Humanity, trusted messenger of God, open our ears for the quiet warnings and calls of the Most Loving Heart of Jesus. Always be in front of our eyes we beg you, that we may understand the word of God correctly, and that we may follow, obey and fulfill that which God wants of us. Assist us in staying awake so that when the Lord comes to get us he may not find us asleep. Arrow of Love and Doctor of God’s Love, wound our hearts with burning love, we ask you, and do not let the wound heal so that we may stay on the path of God’s Love everyday, and so that we overcome everything with love that comes from God. I call upon You to calm my fears and to remove anything that may interfere with my healing. I ask my higher self to close my aura and make it so only energies from God may flow to me. No other use may be made of this channel except for the energies of God. I now call upon Archangel Michael to completely seal and shield this Holy experience. I ask that anything that currently exists in this shield that is not of the energy of God be removed. I ask that the ascended masters and the angels remove any and all blockages, cancers, parasites, and self-imposed limitations both known and unknown. I ask for a complete healing and repair of my energy system by them. I ask that God be with me. I ask that Archangel Michael mark me with his seal so that I may be protected forever from the influences that prevent me from doing our creators will. I now give thanks to God, the ascended masters, the angels and archangels, and anyone else who has participated in this healing and continuing enlightenment of my being.